Tutorial: How to increase range of your toy-grade quadcopter. Here is short Tutorial with video materials about how to increase range of toy-grade quadcopter as is for example Bayangtoys X8. It is not limited to his particular quadcopter, but may be applied to any other quadcopter as well. Plus, there is way to install buzzer – which may serve mainly two purposes: LVC (Low Voltage Controll), which sounds alarm when battery on quadcopter is low, and second – maybe most important thing, buzzer helps you to find lost quadcopter. I think this one is better than old ‘cloverleaf’ antenna. My first record was 550 meters, second one 800, and third one is 1100 meters. Or click to video below to watch whole video, or chose navigation times to watch exactly part you want. Don’t forget to share, comment, rate and subscribe to my YouTube channel if you found it useful. Thanks. Picture below showing how it looks when installed. If you click on the picture, you will get magnification. It opens in new tab. Picture representing dimensions of wires and “sleeve” part. Maximum radiation is in direction that arrow shows. Note that according to math, center frequency of 2450 MHz (on 2.4 GHz band), Lambda is: 300/2450= 0.12245 m, or 122.45 mm. And then 1/4 lambda (1/4 wavelength) is then 122.45/4= 30.6 mm, but this working only for ultra-thin wire. As long as you have thicker wire, there is some so called “Shortening Factor“, similar to “Velocity Factor“. 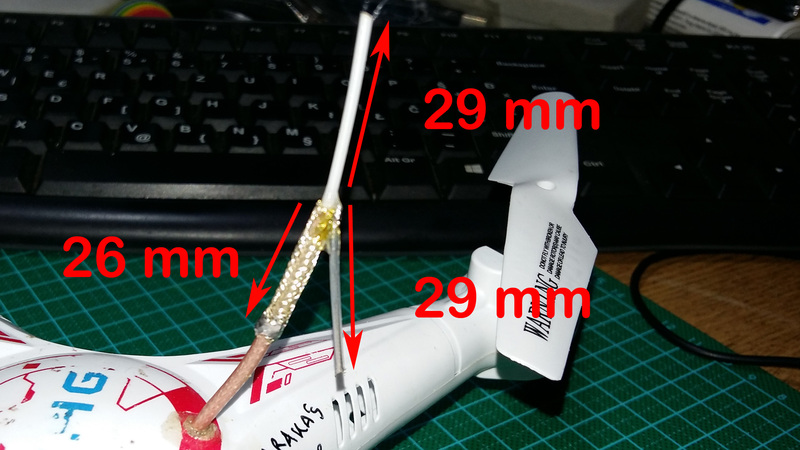 I am opened few WiFi antennas, and found that for this type of wires, it is about 29 mm, and “Sleeve” part, which serve as BALUN (Balanced-Unbalanced) is 26.4 mm (let’s round it to 26 mm). This part serves important role in balancing RF signal from unbalanced (not “symmetric”) signal from coaxial cable into balanced 1/2 lambda dipole (very “symmetric”). All residual unbalanced RF signal goes over this 1/4 lambda sleeve and back over it to initial point, but now in proper phase so that bottom part of the dipole getting maximum possible signal. Recommended coaxial cables for this antenna are: RG316 or thinner “cousin”: RG178. Thicker is better (less attenuation), but also this cable is heavier and can’t be bent easily if needed. My recommendation to use RG316 if possible. Both cables has PTFE (Teflon) insulation inside, which works great on high frequencies. Also, PTFE is heat resistant, so it is not easy to burn center of this cable by soldering iron. Only trouble is that this cable is though, not easy to cut, which is actually good in external application as is this antenna, but pain in the… to cut and manipulate. Yet, it is worth to mess with it, because it is very durable. Before complete whole tutorial, here is video of my record in range flight: 1100 meters with Bayangtoys X8 quadcopter, which had maximum range of 50-80 maybe maximum 100 meters. So, this is incresing range by tenfold! For long ragne quadcopters, you need some FPV goggles. Note that this video is on my second YouTube channel, completely dedicated for video and photo recordings from above, or aerial photo and video. You may subscrive on this channel too if you wish to enjoy my aerial videos. Thanks. The buzzer is relatively easy to install. 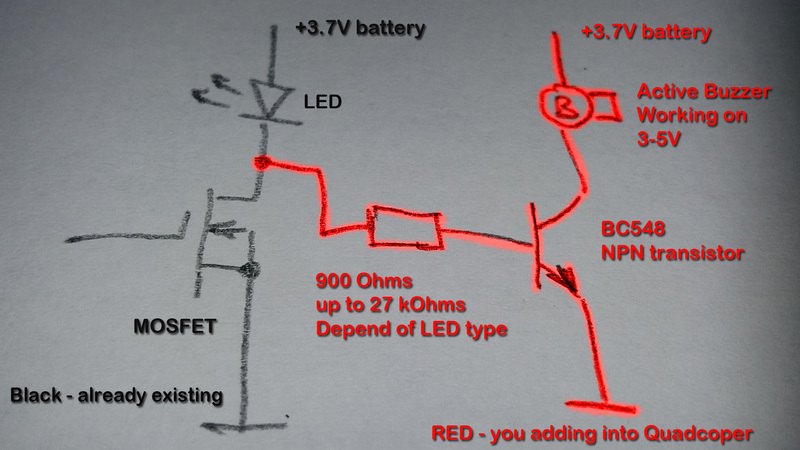 Sorry for hand drawing, I have no brain currently to search for some schematic program that can draw it nicely. Note that I am using white LEDs, which has different properties than stock green and red LEDs. I found that for my setup, 27 kOhm is okay, but someone from RCGroups reported that in order to work properly, resistor should be down to 900 Ohms, or less. Please check it experimentally. This buzzer can save your lost quadcopter, and can indicate low battery, also known as LVC (Low Voltage Cutoff). On this quadcopter, if LEDs are off, buzzer is off as well, but when LVC begins to blink LEDs, buzzer also sounds with intermittent sound. Since, there is 5V voltage booster , no need for any additional electronic, just connect 5V buzzer +ve (positive) to cathode of the boost converter, and -ve (negative) wire of the buzzer to the MOSFET as is shown on this video. great tutorials. it helps a lot and I will build one quadrocopter myself. Thanks for the information. I want to try the antenna mod on my son’s FQ777 FQ11W. After opening the transmitter, I found a single wire antenna of 77mm. Any idea what frequency that’s good for? The toy quadcopter is supposed to use 2.4Ghz. From what I learned, a 1/4 wave should be around 31.23mm. If you can, do exactly as is on my page and videos – because gain MULTIPLIES, not add. If one of two antennas are bad, no much gain changing single antenna. Some people said that no need for changing both antennas – for TX and quad, because they “no need for extra range”, but do not forget that out there are zillion WiFi routers and great amount of jammings. So, better do it properly on TX and quadcopter. thanks for the effort, good information . to the ground di-pole att. leg gets broken off ? It is wise to move antenna away from main processor and motors as far as possible. For this reason coaxial cable is used. Otherwise you can get somewhat good result, but not what I got with antenna as is described. Thank you for your remarkably useful and well-done tutorial. 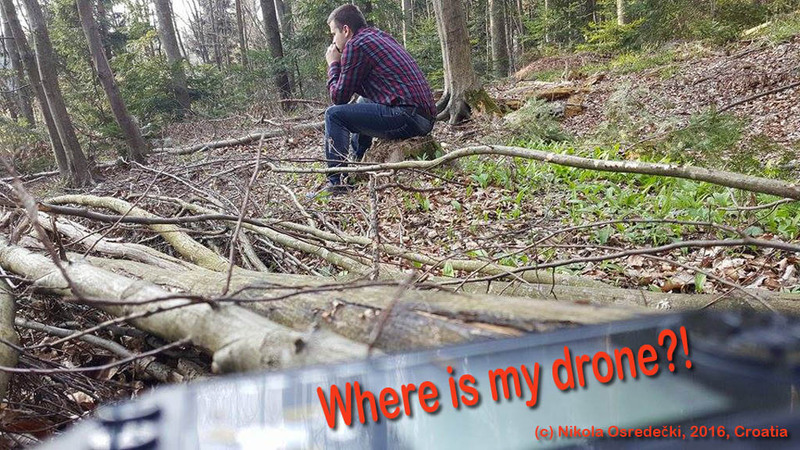 One question: How well would you expect the antenna from a 2.4 GHz WiFi router to work as the broadcast antenna on a drone controller? It will have 1/4 the range with antenna with 3 or more radials soldered on lower part. They made it for home use (WiFi), not for long range use. Antennas from router has only balancing element, but not complete dipole. It is strange that some hobby receivers has the same problem. For example FrSky has one or two bad antennas – just piece of coaxial cable with central wire sticking out. Someone asked me whether it is worth making sleeve + at least one radial, and after my confirmation – he got range that FPV gear can’t follow. Radials are radiating elements, but not obvious ones – one that comes from grounded coaxial cable end. Radial is also central part, but people used to call it usually antenna element. 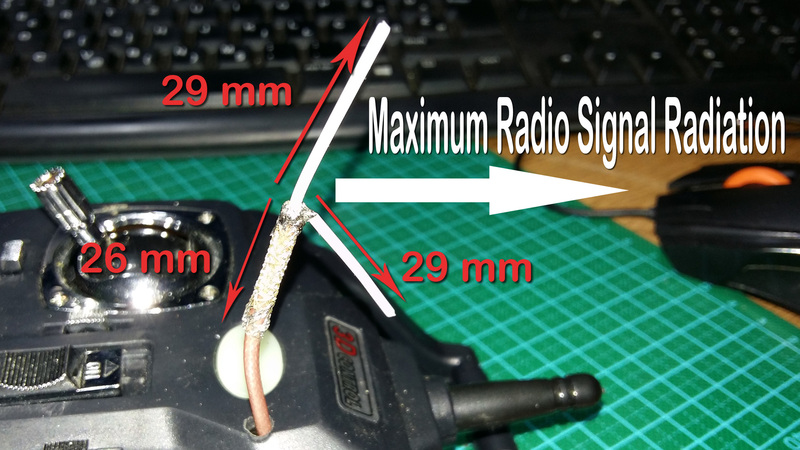 good advice, just made my transmitter antenna for my h8mini FPV and I’ll test it now. You are dead accurate, I have dont this to a Bugs 5w, tonoght I went 100 meters high and 600 outwith no film or other but it works even using common TV coaxial . I did make 2 ways not 1, but all to your spek. 600 out, and 100 high is close to 900 meters. it was resposive and i hit return to home and it came straight back and the funny thing is this drone went for a swim today. yes it has altitude hold and over water we all know it thinks it is on humid land. It still flys its amazing this bugs 5w.